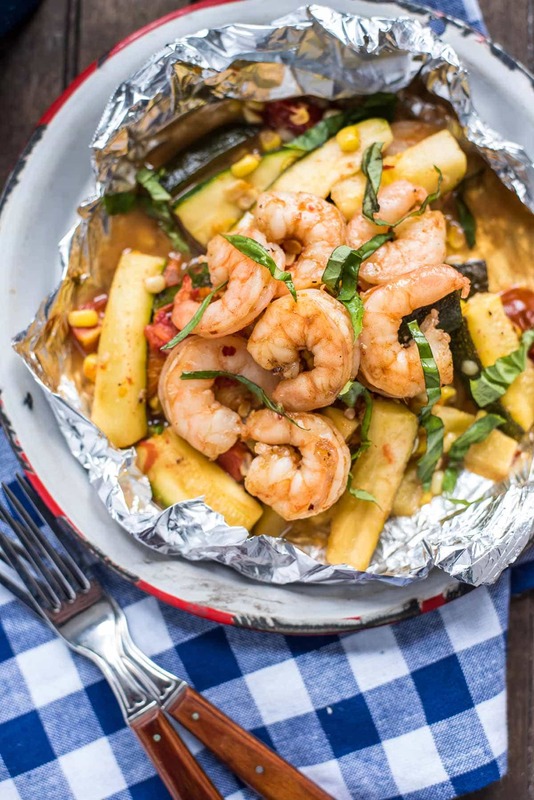 These Honey Garlic Shrimp Foil Packets are packed with the best summer has to offer–zucchini, corn, tomatoes, and fresh basil in a sweet and sticky glaze. Growing up in Ohio leaves one with a certain distrust of weathermen. It’s not their fault, really. I’m sure they do their best. But Ohio is known for its fickle weather, and sometimes not even the best of them can see it coming. I suppose this is why I found myself standing outside in the rain, attempting to grill these Honey Shrimp and Zucchini Foil Packets on an afternoon not too long ago. The day had started off quite lovely, and I had thrown the packets together in the morning, when the sun was beaming bright and warm. By noon, things were looking ominous. By 2, I heard a distant rumble. I rushed to get the baby down for his nap and light the grill, but by the time it was ready to go, the rain was coming down. At this point, there was no turning back. Soggy shoes and dripping hair be damned, I was having grilled shrimp for dinner! I don’t know how often I would say grilling in the rain was worth it, but for Honey Garlic Shrimp Packets, it absolutely was. This is a stupendously easy and delicious way to get a healthy dinner on your table. 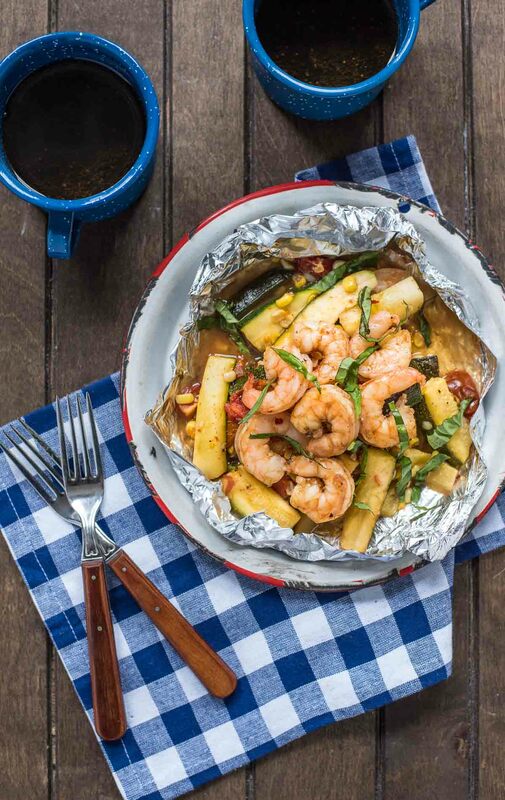 Shrimp, zucchini, corn, and cherry tomatoes are all tossed together on a sheet of foil then drizzled with an amazing honey glaze packed with garlic, ginger, soy sauce, and balsamic vinegar. Everything is cooked with rice to soak up all the sweet and savory juices then served with extra glaze for good measure. This is the kind of fresh, simple fare you’ll want to eat all summer long. It’s perfect for cookouts, camping, or pretty much any summer shindig, even if it does happen to be pouring down rain. I love the sticky sweetness of honey for grilling. You can whip up a honey glaze in minutes, and it’s perfect for slathering on everything from shrimp to salmon to chicken. With minimal prep time and almost zero clean up (hooray for foil packets! 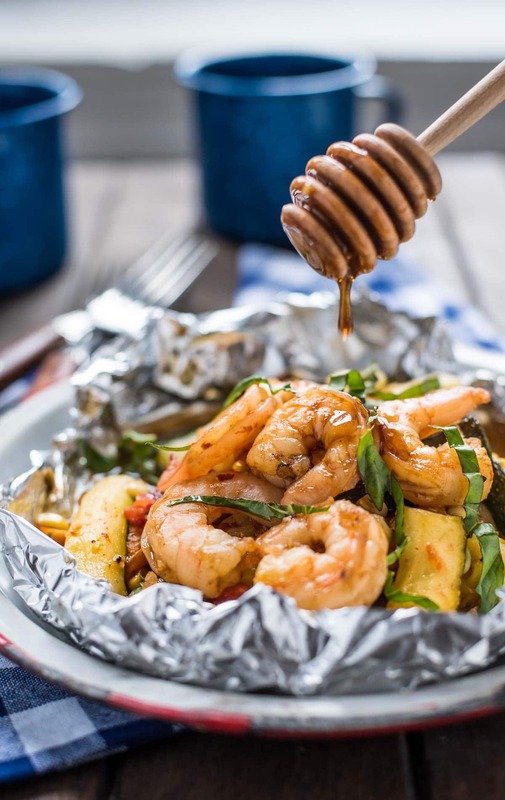 ), these Honey Garlic Shrimp Foil Packets are going to be your go-to meal all summer long. If you’re looking for more ways to use honey this summer, check out these Honey Green Beans with Walnuts and Pina Colada Fried Ice Cream! For more information about the benefits of honey as well as many more recipe ideas, be sure to follow the National Honey Board on honey.com, Facebook, Pinterest, Twitter, Instagram and YouTube. Preheat a gas grill to 400 degrees or medium high heat. Place two pieces of foil in an x shape. Repeat so you have four total packets. In a small bowl, whisk together the honey, garlic, vinegar, tamari, olive oil, and red pepper flakes. Season to taste with salt and pepper. Place about a 1/2 cup of the rice in the center of each x. Divide the zucchini, corn, and tomatoes evenly between the packets. Top with the shrimp. Sprinkle everything with salt and pepper. This can also be baked at 400 degrees for 13-16 minutes. This recipe was developed in partnership with The National Honey Board. Thank you for supporting the brands who keep this blog afloat! This sounds great tasting and simple, just the kind of recipe I love! Have been wanting some yummy ways to use us my fresh basil that is growing like crazy!!! Thanks Courtney. That’s exciting! We have bunches too so I’ve been putting it in everything, including this recipe! I don’t have access to a bbq and would have to cook this recipe in oven. What temperature and how long in oven please? I’ve never tried it in the oven, but I would try around 400 degrees for 10-15 minutes. Good luck!